Widgets ist einer der super features in OSX. Einer meiner Liebelingswidgets ist Swissradio by Cyberdog. So kann ich DRS3 hören und von der guten alten Schweiz träumen. Auch bekomm ich dann auch mit was politisch so geht und verlerne mein "Schwytzerdütsch" nicht ganz. My plan to read through the bible is not a speed reading contest. I believe to understand God and His plan better is to read what happened in the past. This morning I finished Leviticus. It leaves me thankful that I wouldn’t have to bring the sacrifices the Israelites had to bring to be acceptable to God. Today I live with the privilege to be accepteable before God solely by His grace and by what Jesus did for us. His blood was the ultimate atonment for sin. There are many incidents in my life where this became very real to me. Mystic experiences. Times when God would reveal His holiness and also His forgivenes. Leviticus shows me that God is a holy God. We can’t have compromises . But also a God who wants to be in relationship with His people. He makes a way. Some weeks ago I thought I should read through the bible again. From Genesis to Revelations. I really like Genesis and there were again a lot of things that sprang up to me. Then Exodus with Moses’s relationship with God is very interesting and encouraging. Now I’m half through Leviticus and I have to say it is the real test in bible reading. All those sacrifices. It goes on and on. It was a very bloody affair to worship God in those days. Make no mistake. Two of Aaron’s sons died because of a mistake in the procedure and were consumed by the fire of God. I’m sure glad that Jesus became the atoning sacrifice by dying for us. Just imagine if today in worship we don’t put our hands high enough or sing out of tune the fire of God would come from the front and consume us. It also makes me think that the presence of God that came to the tent is now in us through the Holy Spirit. Am I taking the relationship I have with God to lightly? In my life I experienced two occasions where the presence of God was so strong that it scared nearly to death. Yesterday I spent the day in Fang. With the lahu church we planted. Enoch and Mida organized for the people from Hui Kau Laam and Ken Tun to come for worship. We had a great morning of sharing, worship and a meal together. It was ten o’clock when I made my way back to Chiang Mai. It is our holiday this week and I didn’t want to spend the night. When I was leaving I realized that my tank was pretty low. So I thought I would stop at a petrol station on the way down. There are stations in Chai Prakan, Chiang Dao and Mae Taeng. But as I drove on the gauge was pointing on empty and all the petrol stations were closed. It was then that I remembered a law that was passed to have all petrol stations closed at 10 pm. (I think the law was to cut down on fuel consumption) As I was driving I pictured myself sleeping in the truck for the night and waiting till five in the morning at a petrol station. But as one of those "crazy" Christians I asked God to get me home or to the next open petrol station. So I drove over a hundred km. on a empty tank all the way back home. "Thank you God you truly are my provider!" Now for people who don’t believe in miracles they sure would have an explanation for this. For me it was another confirmation what a great God I have. This morning I went to tank my truck 69.51 liters. My tank holds 70 liters. So after all that driving there was still some left. This way I started the week with a nice feeling and also with a nice cup of coffee. 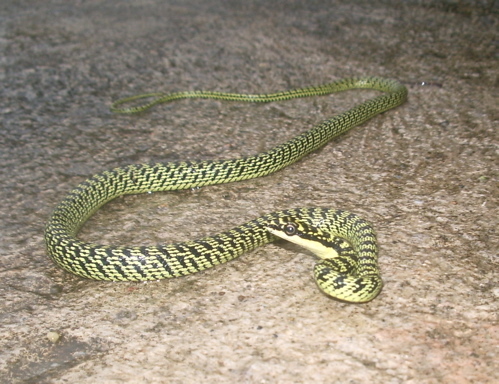 This morning I got woken by the shouting of my lovely wife’s voice:”a snake, there is a snake. After wondering if I should take it seriously or not I decided that it sounded pretty desperate. So I got up to have a look. Apparently it was like this. Timmy woke up and felt something on his neck. He grabbed it and threw it across the room realizing it was a snake. The snake was about half a meter long and very thin. It got out of the room and then back again. Later it went out on the balcony where it probably came in at the first place. A minute later Shela (our dog) started barking. I then disposed of the snake jungle style….. Yesterday I made a quick trip into the Prao valley. A two hours ride to bring food to the Prao boarding home. I got a phone call the evening before and was told they run out of food and have no money to buy any either. So I got a hundred kilos of rice and visited. The problem is that the public school used to give the children three meals a day and supported them with some other things. That stopped a months ago. We pledged to support the home with 600 kilos of rice a month till the next school term April 2007. There are a lot of needs for that place with 55 children. Our visa will be valid till end of december. The application for the new one already started. Photocopies of documents, signatures and passphotos. I had to send alot of money to the Swiss Embassy for a "certificate of nationality". The passport doesn’t seem proof enough that we are swiss. I’m glad we are under a foundation that deals with the whole process. Still I have to run around for some of the things. So far we were blessed with our situation. So today was more or less a visa day and paying bills. I took me only half an hour to pay the elektric bill. They used to come to the house to collect the money. Now I have to go to their office to pay. I seem to go the when everybody else wants to pay. I found this cool feature to track the comments I write on other blogs. It is getting harder and more time consuming to see if other people commented on comments I made on any blog. CoComments is a great application to solve a time consuming problem. To sign up is easy and and free. I put a link on my toolbar in Safari (my browser). When I write a comment I click the link and it makes the connection on CoComments. I have also a feed on the toolbar in the browser that shows me how many new comments I have. Check it out for yourself.